The Pew Hispanic Center, a project of the Pew Research Center, released a report showing that Hispanics now make up more than one-in-five of all children in the U.S. - up from 9% in 1980 -- and as their numbers have grown, their demographic profile has changed. Note that we're seeing something similar right here in the Puget Sound region--for example, in the Seattle School District it has been estimated that one in five enrolled students is Hispanic. So, while the Seattle-area Hispanic population density is at 8%, school-age Latinos make up 20% of the population. More than half of the nation's 16 million Hispanic children are the U.S.-born children of at least one foreign-born parent, typically someone who came to this country in the immigration wave from Mexico, Central America and South America that began around 1980. In summary, what we're seeing is that the children of these immigrants are more likely to speak English, finish high school, and be documented U.S. Citizens than their parents--note that fewer than one-in-ten of all Hispanic children are unauthorized immigrants. The report, "Latino Children: A Majority Are U.S.-Born Offspring of Immigrants," is available at the Pew Hispanic Center's website. TONIGHT: Celebrate the 5th Anniversary Party at Rock Salt in Seattle! Background: Miami Nights on Fridays at Rock Salt started in May 2004 and is still strong every Friday night, providing great music in a comfortable atmosphere. Seattle Hottest Mix of Salsa, Merengue, Bachata, Reggaeton, & Top 40. This Anniversary they will also be celebrating the CD Release of Seattle's newest Salsa Band, Orquesta Guaschara. This is Steve Guasch's band and is a powerful and dynamic Salsa Orchestra. DJ Manny's 19th Annual Birthday Bash with live music by Latin Expression. Did you know about this event? represented in the community and its residents. With over 120 languages spoken in the Kent School District, the Puget Sound area is a top choice for new immigrants. In response to this local growth, Kent4Health, a group of residents and businesses that encourage healthy choices for physical, mental, spiritual and environmental wellness, is organizing this event to showcase the region’s talent. The Festival will incorporate ethnic dance, musical performances, spectacular native attire, arts and crafts booths and delicious authentic cuisine. The event will take place at the Kent Town Square Plaza. For details on the event, see the Kent International Festival site. Also, the Kent Reporter is creating an event insert for its weekly publication that will also be handed out at the festival. If you'd like to advertise, contact Carol Bower at 253-872-6681 or email cbower@kentreporter.com. Get set for a free cultural event in the heart of White Center! 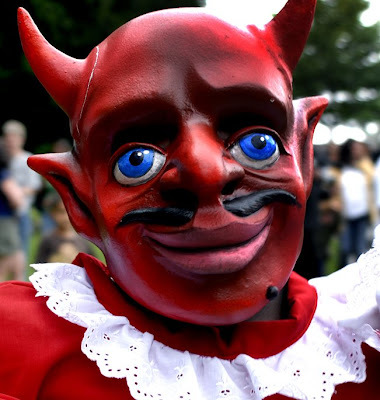 It's the Devil's Dance Parade! Check out the local press and more details on the origins of the event and music you'll experience! "Fiscally prudent, and the results bear testimony," reads the headline. I just received our office copy of Seattle Business magazine, and on p14 is a story on Plaza Bank. Get your copy and take a read! Plaza Bank launched in 2006 with a commercial lending office in downtown Seattle and a retail branch at Kent Station; today it stands strong with $89 million in total assets. In a climate that has witnessed most banks’ assets fall, this bank has even seen a small increase. While other banks are conserving capital by stopping loan growth and reducing their existing portfolio, Plaza Bank is still in growth mode and is continuing to lend. It shows a 17 percent capital ratio—twice the level of an adequately capitalized bank at 8 percent. What’s its secret? To start, the bank never took on mortgage lending nor did it invest in mortgage interests. Additionally, Plaza Bank was founded on reaching out to Latinos and other minorities in a way that is meaningful. In fact, its total loans to women and minorities were over 40 percent of total loan balances outstanding at the end of 2008. Approximately 70 percent of its consumer loans are to Hispanics. Its consumer loans generally pay much better than their commercial counterparts based on a lower default rate; the difference may be due to customers choosing to consolidate higher-interest debt into more palatable payments, or because the loan is a home equity or auto loan. Says President and CEO Carlos Guangorena, “People don’t want to default because they need their cars and homes. They’re a part of your everyday life, and the last two things you want to lose.” Though the sheer number of consumer loans is larger than the number of commercial loans, approximately 90% of its lending is on the commercial side. About 23 percent of its commercial loans are to Latinos; a total of 40 percent to combined minorities and women. Examples of the types of commercial lending Plaza Bank sees include loans for a business secured by commercial real estate, or a revolving line of credit to help with cash flow. Poised to weather the storm and rebound with the economy, this is one bank whose future could be described as brillante. King County Latino Entrepreneurs: Your Input is Appreciated! Here's a request from one of our readers. Are you a Latino entrepreneur in the King County area? If so, please help by taking the survey (links below)! I’m currently conducting an independent research study that focuses on Latino micro-entrepreneurs throughout King County. The main objective for the study is to better understand the needs, and potential obstacles, that these entrepreneurs might have in terms of business development, sales, and operations management. At the same time, the results from the study will help us develop a curriculum that will be use to teach a series of free business development training seminars in the fall. This academic research is part of my entrepreneurship degree at the Michael G. Foster School of Business at UW. I’m also working with the Business and Economic Development Center, as they are providing mentorship and act as the supervising source for the study. Basically, at this point we are trying to reach out to the community and let people know about our survey that is available online and hard copies as well. WORKTANK giving Seattleites something to smile about! This is not a Hispanic market-related post, but one that I just feel compelled to make. Worktank, a Seattle ad agency, has come up with an original idea to show Seattleites that lemons can be turned into lemonade--and for us to share our own stories. 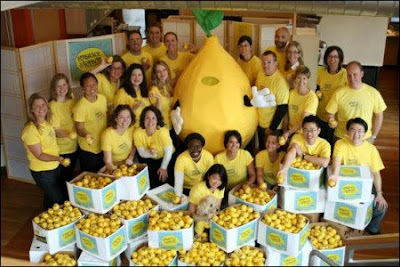 It's called "Embrace the Lemon," and it's got its own Facebook page, Twitter account, and mascot (a lemon, what else?). It's a feel-good campaign, and I personally like it. Especially these days, when all we're hearing is doom and gloom, it's nice to incite people to talk about happy endings. You know what I mean. A posting on the P-I's site today talked about the campaign. They're not embracing the lemon (YET), but it's still good press in my opinion. Take a read. 1) The launch ad feels all too reminiscent of that class European ad, "Mr. W." (If you haven't seen this ad, do it now. It's my all-time favorite!) Maybe that's what they were going for. 2) This campaign better not be hiding some Worktank client (aside from the agency's own brand). I have no issue with them promoting themselves, but if we find out that all this feel-good hype is actually promoting some other brand, I'm going to be very disappointed. Seattle Sounders FC brings great energy! Fredy and I, at the Hispanic Chamber this morning! It was super having some key folks from the Seattle Sounders FC staff and team with us this morning at the King County Hispanic Chamber of Commerce networking breakfast. Bart Wiley and Carlos Oseguera, longtime sports management for Sounders and Seahawks, talked about what the Sounder FC team's management is doing in terms of outreach. They talked about how the management is second to none, creating a membership alliance out of the fan base and giving its fans a greater feeling of ownership and loyalty. They also mentioned that they've surpassed all imaginable goals when they not only sold 26K season tickets, but also by selling 1850 out of 2000 just-released nine-game passes over the past three or so days! Bart and Carlos shared their excitement and appreciation for the magnificent response they've received from Seattle-area fans. From the team, Osvaldo Alonso from Cuba, and Jhon Kennedy Hurtado and Fredy Montero from Colombia, joined the breakfast--at the early hour of 7am! They were cool guys. For more info on the Sounders FC, visit their website. For more info on the Chamber, click here. All are welcome to a talk and reading, given by Norma Cantú of University of Texas at San Antonio. Cantú’s teaching and research interests include Chicano/a literature, U.S. Latina/o literature, creative writing, border studies, women’s studies, and folklore. The 2007-09 Wismer Professor, Gabriella Gutiérrez y Muhs of the Department of Modern Languages and Women's Studies extends this invitation to all to join us at this event to honor this renowned Chicana author. A Madrid Celebration in ... Kenmore? Yes, it's the Fiesta de San Isidro! The Spain Association of the Pacific Northwest will be celebrating the Madrid tradition and serving cocido madrileño and jamón serrano among other delicacies. Cost is $12 for members, $18 for non members. 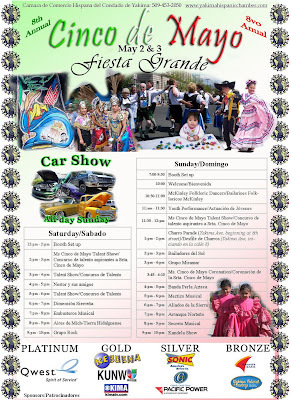 If you want to learn more about the Fiesta de San Isidro, its history, traditional food, music and costumes, or to become a member, visit the organization's website! A local lawyer has taken on the case of a gentleman who speaks Mixteco and has been unable to find someone who speaks English and Mixteco. This is a rare query, so feel free to share with anyone you think might have the right connection! Thank you! Speaking of EDUCATION ... read what the Martinez Foundation is doing! This just off the press - Edgar and Holli Martinez are sponsoring 15 - count 'em - 15 Masters in Teaching scholarships for students of color through the Martinez Foundation. They're helping students at three schools, University of Washington, Washington State University, and Seattle University--with 5 scholarships to be awarded for each university. Read the story and learn about the first recipients! Congrats! Please join the Aguilar Scholarship Committee, the Latino Community, and the University of Washington for an evening of fine dining and spirited auctioning. Let's celebrate the first endowed scholarship for Latino students in the MBA Program at the University of Washington and recognizing Latino MBA students at the UW Michael G. Foster School of Business. The scholarship endowment recognizes Ernest I.J. Aguilar, the founder of the Washington State Hispanic Chamber of Commerce and numerous other community and business organizations. You can register at http://www.brownpapertickets.com/event/59287. The organizers offer various levels of event and media sponsorship opportunities; ask me for a sponsorship packet and learn more about how your company can support the success and advancement of Latino MBA students at the UW Michael G. Foster School of Business. Or contact Jesse Robbins directly at jesselr@u.washington.edu or by calling 206-543-3681. ¡Hola! Below is the calendar straight from Centro Cultural Hispano Americano - you may be interested in some of our community's many cultural goings-on! Take a look! A rare opportunity to see Cuban virtuoso Hilario Duran in concert with the Duran/Schloss/Mitri Trio and Seattle's own Cuban music ensemble Charanga Danzon at Town Hall Seattle. The Pacific Jazz Institute and Dimitriou’s Jazz Alley presents Brazilian jazz with Trio da Paz, for three nights. Band members are Romero Lubambo (guitar), Nilson Matta (bass), Duduka Da Fonseca (percussionist/drummer). Set times Thursday – Saturday at 7:30pm and 9:30pm. Doors open at 6pm on Thursday and 5:30pm on Saturday.Featuring three of Brazil’s most in-demand musicians, Trio da Paz updates the infectious spirit of jazz-oriented Brazilian music. On Tuesday, June 2nd, 2009 at 7:00 p.m., Centro Cultural Hispano Americano is having an organizational meeting for the participation of the Hispanic/Latin American countries in the Torchlight Parade, which will take place on Saturday, July 25 at 7:30 p.m. in SeattleIf you have a folkloric costume from your country and would like to be part of this effort, please come to Seamar Clinic, located at 1040 S. Henderson, Seattle, WA 98108. Next meetings: Tuesdays June 2nd, 16, 30 at 7:00 p.m. At Sea Mar Clinic; and Saturdays July 11 and 14 at Seaward Park in Seattle. Wesley Dyring, viola, violin & director; Jeannie Wells Yablonsky, violin; Kevin Krentz, cello; Zartouhi Dambourian-Eby, flute & piccolo; Joe Kaufman, bass; Peter Caruso, requinto & guitars; Michael Nicolella, guitar; Fred Hoadley, piano & tres; Alexander Dyring, tiple colombiano & percussion; Diego Coy, quena & percussion; Pedro Vargas & Ricardo Guity, percussionTickets starting at $19.Purchase online at www.seattlesymphony.org <http://www.seattlesymphony.org/symphony/buy/single/production.aspx?id=7487&src=t&dateid=7487> or by calling (206) 215-4747.
International Festival at Angle Lake Park in SeaTac. Eduardo Mendonça & Show Brazil! Brazilian Music. Featuring: Eduardo Mendonça (Guitar/Vocal and Percussion); David Pascal (Bass); Josh Wilson (Keyboard); Kohen Burrill (Drums and Back Vocals); and Nelson Bell (Trombone). The State of Hispanic Literature in the United States with Ronaldo Hinojosa-Smith. A reception will follow. This is the second lecture in the series in the United States. This event is organized by the Spanish and Portuguese Studies Department at the University of Washington and the Instituto Cervantes. Last night I attended the Capitol Hill Chamber of Commerce Seís de Mayo event that was really fun! It was at the new-ish Barrio restaurant, up on 12th Street between Pike and Union. You're probably wondering why, if our office is downtown, I was at the Capitol Hill Chamber event. Well, first of all I'm a long-time Capitol Hill resident, and second of all, events and membership are open everyone! The Chamber is a growing organization that has about 170+ members and several active committees. The folks I met last night represented all kinds of different industries, from telecom to publishing. Check out their site for more! Good area for groups to meet! As it warms up, they can practically open up the whole darn restaurant so it'll feel al fresco! And I learned that Barrio is owned by the same folks who brought us the wonderful Purple Cafes. Take a look at their site for more info. Girl Scout Latina Twilight Camp - First Time This Summer! Join us during the summer of 2009 for the first Girl Scout Latina Twilight Camp “En busca del Dorado.” We offer a twilight camp where Latina girls and adult volunteers can come together to recognize the diversity of Latin-American cultures and learn about outdoor activities in Girl Scouts. This camp is going to be done mostly in Spanish. The price includes activities, snacks, insurance, shirt, badge and lots of fun! Camp registrations open on April 25 and closes to June 5. All placements will be first come, first serve. Confirmation notices will be e-mailed or mailed upon receipt of registrations. Please contact us to get a registration form. We are looking for volunteers!!! All volunteers would receive training before camp, and the daughters of FULL TIME volunteers will pay only $30!!. If you want to request a registration form, to volunteer, to participate, or for further information on the program, please contact the organization's Latina Program Coordinator María Alejandra Gómez at latinacamp@yahoo.com or mariaag@girlscoutsww.org or call 425-614-1126 or 206-399-4612. Everyone is going to have fun! See website for more! Loved it! Funny, if you think Starbucks is everywhere, you should meet Nescafé. It's global, and it's beloved. Just not in the U.S. it seems. Even right here in the Seattle area, when asked about top-of-mind coffe brands more of our Latino study respondents mentioned Nescafé first (154 respondents), followed by Starbucks (89) and Folgers (47). Arial International is our neighbor to the south--it's an organization dedicated to helping companies keep their Spanish-dominant clients happy! They offer everything from Spanish proficiency testing for staff recruiting, bilingual certification, retention consulting and training, and more. Today they put out their Spring Newsletter, chock full of great information on how to retain that Latino customer and also some good tips on using Twitter. (Full Disclosure: it includes an article penned by moi.) If you'd like to receive the full newsletter please email me at lauri@conexion-marketing.com and I'll make sure you get it. Also, if you'd like to receive our semi-regular (once a month at most) mailings, let me know and I'll put you on our list! One more thing: I'm at www.twitter.com/ljordana in case you're on Twitter, too! In the "old days," when Jorge Madrazo was running the Mexican Consulate here in Seattle (before he moved on to lead SeaMar), he'd spend some time reminding everyone at the big Cinco de Mayo party that "Cinco de Mayo is not Mexican Independence Day!" So I'm taking this opportunity to carry on that tradition right here at No Es Muy Típico. Cinco de Mayo is all about celebrating the Mexican victory over the French at the Battle of Puebla. Mexico's Independence Day is September 16, or Dieciséis de Septiembre. Which doesn't quite roll off the tongue the same way for us gringos. In any case, ENJOY in good measure. 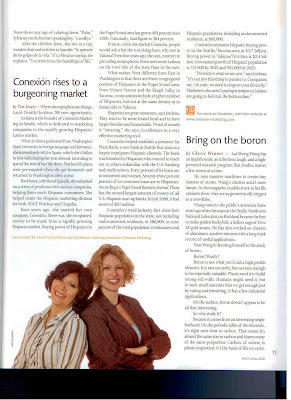 Well, Gigi and I--along with the state's current Hispanic demographics--got a little press in the latest magazine put out by Washington State University, my alma mater. In the summer issue of Washington State Magazine, Editor Tim Steury includes a Panoramas feature on "Mixing It Up," and there we are! Just received a thoughtful message from Rebecca Lambert at Bustos Media. After careful deliberation, the team has decided that it's simply not a good idea to hold an event of this size while we watch the swine flu spread (I know the virus has a "new" name now, but I can't remember it). She sent this letter to all her contacts, including the event sponsors. This is the first such postponement I've heard of. Obviously, no one wants to encourage the spread of the swine flu, and in PR terms, it would be terrible if there were some outbreak that were traced back to a particular company's event (and the companies that sponsored it), definitely. I'd be interested to hear what others think about this decision. Come and join us at the 8th Annual Fiesta de Guatemala for a spirited event! Build a school and plant 4,000 trees in Guatemala. Provide scholarships to 41 low-income, Seattle-area students to participate in Global Visionaries' Leadership Program and service trip. Support our local leadership training and community service program for GV participants in Seattle and to bolster a GV program for Guatemalan participants in Guatemala. Provide funding to bring Guatemalan Youth Board students to volunteer in the U.S.
Come and join the 4th annual Cinco de Mayo celebration at the Jefferson Community center for Children activities, live entertainment, traditional food and a fashion show. Admission is free. Following is an appeal, on behalf of José L. García-Pabón, Ph. D. of Washington State University. Please share this information with others who might also be concerned. 1) I won’t be able to continue conducting the trainings and institutes on strategies to better serve the Latino community that are helping WSU Extension educators and many service providers to increase their work with and services to Latinos. 2) I won’t be able to partner with WSU Extension in Franklin and other counties to support and develop programs targeting Latino families (such as the Pathways literacy program in Pasco). 3) I won’t be able to provide information and assistance to Latinos in rural areas and small towns, in particular those involved in agriculture. 4) I won’t be able to partner with nonprofit and community organizations to help them provide more and better services to the Latino community or contribute to Latino-related boards and steering committees (such as the TC Hispanic Chamber of Commerce). 5) I won’t be able to partner with other researchers (WSU and other universities) to conduct culturally appropriate research with the Latino community to better understand the community, its trends, its needs and issues in order to develop effective outreach programs. 6) I won’t be able to help decrease the misunderstandings and stereotypes about Latinos, since I have given many presentations about who we are, what we do, what our contributions are, how diverse Latinos are, etc. 7) I won’t be able to educate WSU students, through guest lectures and campus presentations about issues impacting our community but also about the Latino contribution to economic development. 8) The diversity of WSU and its efforts to reflect the demographics of our state will be reduced. Jussaume (rajussaume@wsu.edu) about this situation as soon as you can, due to the short window for comments. Please feel free to forward/share this situation with others. José L. García-Pabón, Ph. D.
There's going to be a march today! ...But I'm not sure how many people will be involved this year. Any guesses? For sponsors and viewers alike, KCTS' local V-Me affiliate is a fantastic opportunity to benefit from quality programming en español. V-Me staffers are also involved in the community through its outreach programs. Visit their site for more details. For those of you in the Seattle area still hiring or looking to fill gaps left by layoffs, I'd like you to know about a native Spanish-speaking Latina professional who's available to start work right away! Part time, full time, or consultation! Laura is a usability / UX specialist that through review, research, testing and analysis makes sure the user interface of clients' websites is effective and intuitive to the target audience. Most recently she worked in this capacity at Blink Interactive, even conducting Spanish usability testing, for clients such as Microsoft, Flexcar, Getty Images and Amazon. Laura has a certificate from UW in user-centered design, and is available today for freelance, full-time, or even consult for a quick web usability "checkup" at a reasonable price. If you'd like to know more about Laura's experience and see a portfolio, contact Jennifer Hopper at Creative Circle at (206) 652-5552 or email jhopper@creativecircle.com. For more on Creative Circle, see their site. On May 5 (this Tuesday), there will be a local party at the Tacos Guaymas at Greenlake. This is a verdedero Cinco de Mayo! Look for DJs, a rock group, and of course, mariachis! WHEN: Cinco de Mayo, of course! Starting at noon, ending at 2am! It's that time of year again, when Cinco de Mayo parties are happening all over. Don't discount Yakima! All weekend long, Yakima will attract people from all over Washington to its traditional celebration. Sponsors include Qwest and Banner Bank, among others. For more details, visit the Yakima Hispanic Chamber of Commerce site. Torchlight Parade - Latin Americans Interested? Tomorrow, Saturday, May 2 at 1:00 p.m., Centro Cultural Hispano Americano is having an organizational meeting for the participation of the Hispanic/Latin American countries in the Torchlight Parade, which will take place on Saturday, July 25 at 7:30 p.m. in Seattle. If you have a folkloric costume from your country and would like to be part of this effort, please come to Seamar Clinic, located at 1040 S. Henderson, Seattle, WA 98108. If you are part of a national organization (Chile, Peru, Nicaragua, etc. ), please inform your organization the importance of your participation in the parade.